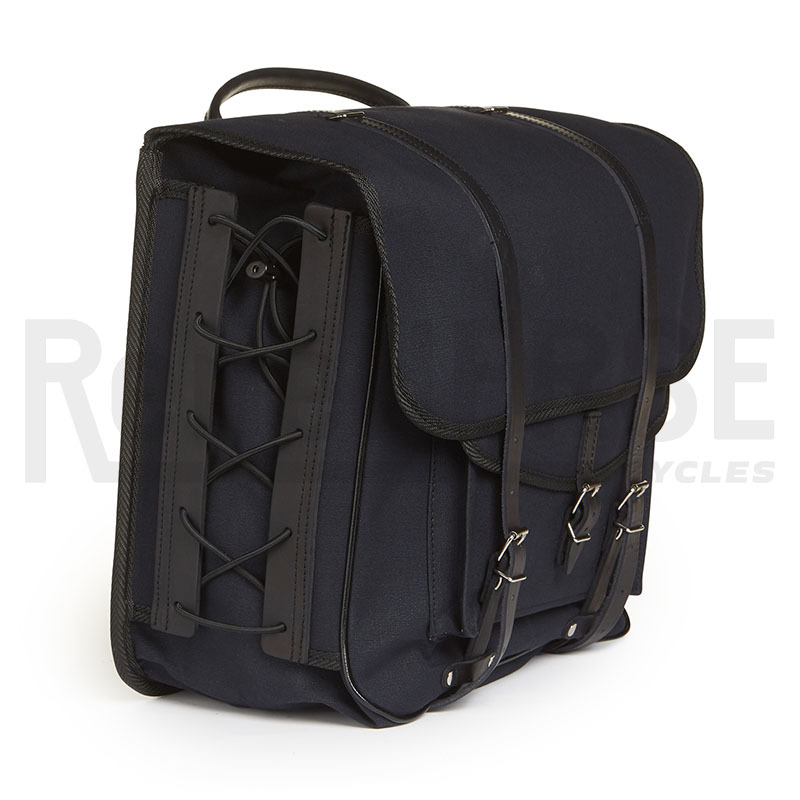 Berthoud panniers combine waterproof durability with classic style. Even today, they continue to be the best panniers in the world. The laces allow adjusting the volume to your luggage, from a quick overnight trip to a round-the-world tour. For panniers, we’ve found that the traditional mounting system, with leather straps and a steel spring, provide the most secure attachment. The pannier is tensioned, so it doesn’t rattle. The straps fit on (almost) any rack. And the panniers are harder to remove, which acts as a theft deterrent when you leave the bike unattended: You don’t want to carry all your bags every time you visit a cathedral or museum! We offer these special models in the classic blue-gray color and in black-on-black. Both colors develop a nice patina over the decades. We’ve used classic Sologne panniers that are more than 40 years old. They’ve developed a wonderful patina, but they still work great. So we are excited that Berthoud continues to make them. They are sewn in France by hand, from waterproof cotton, and edged with leather (tan edging only). These traditional materials work well, keeping our editor’s bag dry during a 50-hour ride in the rain in Paris-Brest-Paris. GB 1500: 25 liter/pair, 21 x 35 cm (8.5″ x 14″). Single leather strap. Spacing between rack attachment straps: 16 cm. Weight: 1380 g.
GB 367: 33 liter/pair, 31 x 35 cm (12″ x 14″), tapered for heel clearance. Double leather strap. Spacing between rack attachment straps: 18 cm. 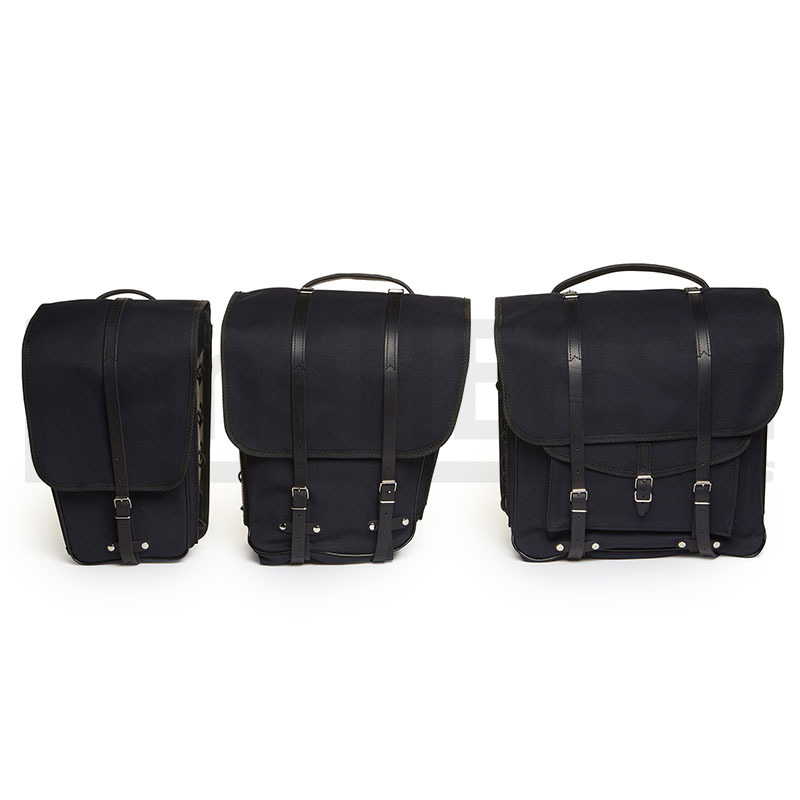 Weight: 1750 g.
GB 372: 39 liter/pair, 35 x 35 cm (14″ x 14″), square shape – ideal for carrying on the front. Double leather strap. Outside pockets. Spacing between rack attachment straps: 18 cm. Weight: 2150 g.